I found this fascinating to hear. In having already known that a similar abhorrence for 4am had necessarily rendered my boss a night time writer like myself, I still hadn’t realized how much our writing habits differed. My boss treats his writing the way I used to deal with homework: immediately after school to get it over with ASAP. He treats it like an extension of his work day. And it works for him; he gets the job, as it were, done. When I come home from work though, the last thing I immediately want to do is more work-like stuff, i.e. banging out words on the computer. Usually I’m hungry, so I start dinner right away. I also need to unwind from a bit: this involves listening to music, catching up on some blogs that I follow or my own blog, reading a book while eating dinner (I live alone so no one is being ignored by this behaviour), and tidying up my apartment. It’s only then – after my dinner dishes are cleaned, my lunch is made for the following work day, I’ve washed and changed into lounge wear, unplugged my modem, and selected the appropriate “writing music” – that I settle in to spend the next two hours putting words on the page. Because writing is my relaxing evening that I enjoy. Since I don’t consider writing a chore (even when the physical process of finding the right words is a chore) and it’s something I look forward to, I don’t like to rush to get to it. Part of this, I’ll admit, can be attributed to a penchant for delayed gratification. More so, though, I always want to give writing the space it deserves to take up the whole rest of my night should I hit a strong groove, without worry for the fact that I hadn’t yet made my lunch. But what about you? Do you do your writing as soon as humanly possible? Do you wait until the moment is just right? Do you consider writing something of a burden – one you love, of course, yet still something that has to be done, and is best done as soon as possible? Or do you consider it a joy of which you savour every moment? The possibilities and combinations are endless. Tell me about yours in the comments. This entry was posted in Lifestyle, Writing, Writing life and tagged Inspiration, Work-life balance, Writing habits, Writing inspiration. Bookmark the permalink. I almost think about my writing all the time, even when I’m at work there are moments I jot down random bits of inspiration to include or think about and I am always looking forward to my next writing session. I woke up really early this Saturday and started writing pretty soon after. That’s either extremely sad, or extremely passionate but I’d like to think it’s the latter! I don’t see writing as a chore, or something that necessarily ‘has’ to be done but I do miss it if I don’t. I love the idea of giving your writing the space and time it deserves, I think I need to adopt that approach occasionally! I commute, so a lot of mine is done in the hour I sit still on the train which actually turns a wasted 60minutes into my daily therapy session! Hi Amy, thanks for the comment! There’s a famous quote by playwright Eugène Ionesco that I think applies to you (and probably ever other writer worth his/her salt): A writer never has a vacation. 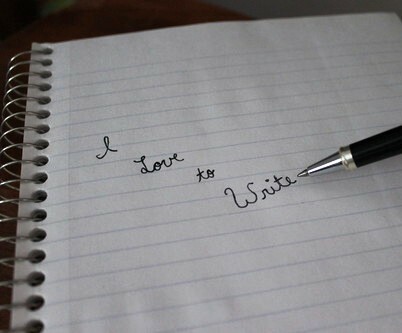 For a writer, life consists of either writing or thinking about writing. I do like to give my writing space, but at the same time, I try not to be too precious about it. 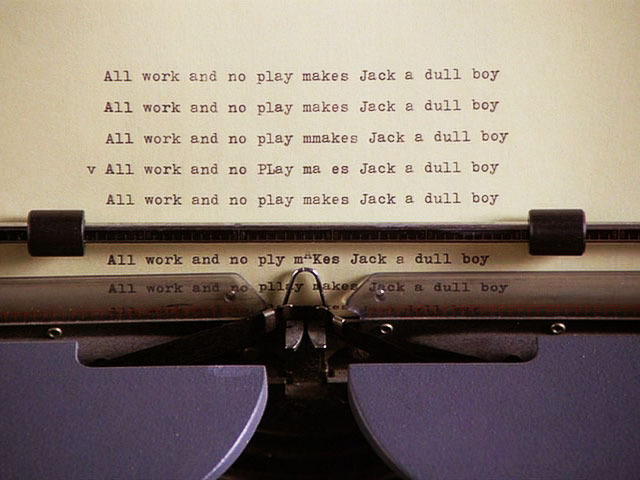 More and more, I’m trying to maximize those enforced periods of idleness (waiting at the dentist’s office, the line-up at the bank) and get some writing “work” done. I commute by bicycle so I unfortunately can’t do any writing then. I do get some good thinking done about my writing while riding, though, so that helps. Writing is my soul food.. mmm mmm mmm… I lick the plate clean! Due to illness I don’t work which may sound great, as in I can write all day. But my illness means I’m fatigued constantly and so I have to fit writing in around rest periods and sleep. But I make it work, because, like you I NEED it! I even make working with my publisher work… he is in California, I’m in Ireland! As the quote says “nothing worthwhile comes easily!” Happy writing! I find that the more time I have to write, the less I actually do. It’s as if without the stress and pressure of only having a couple of hours a day to produce words, I don’t give my writing (or my time) the respect it deserves. This would pose a real problem if I ever became a full-time writer, so I’d better work on learning to use my unstructured time more productively! Writing while ill is probably a huge challenge, so good for you for finding a way to manage it. It’s true that nothing worthwhile comes easily and also that the best way to determine what’s most important to us is to try to take them away from us. Ditto. I fit mine in in the morning, where if I can manage the pills just right, I’ll get a couple hours worth of time with a functioning brain – around a nap or two – and the writing can get done. It helps to know that if I miss my window today, there won’t be another for almost 24 ours: it makes writing a serious business. When I get into it, it is amazing – flow. So it’s worth all my good time. I can get up at any ungodly hour of the morning I need to (especially if it involves a plane ride to an exciting locale), but for some reason, my creativity and ability to put down words doesn’t seem to come online until nearer to the end of my day. My day runs completely opposite to yours: Theatre work in the evening, so go to work around 5pm, and get home somewhere between 11pm and midnight. I’m useless for anything but a snack, some decompression time, and bed. But our actual work routine is similar, except that i start in the morning: get up, exercise and eat and get any hometime tasks out of the way. Then I get down to business knowing that I have nothing to concern me until I have to leave for work. You always were a creature of the night, weren’t you, my dear? 😉 I think our similar lifestyles is part of why we get along so well! As you are quite familiar with my backstory, I’ll only say that I write mostly on the weekends and occasionally during the week. Writing is both an obligation and a leisure activity, because that is how I execute my leisure activities (yes, I noticed my use of the term “execute” and what is says about me). I practice my musical instruments that way too. I’m always “working” on something. It’s quite torturous in a way, not being able to sit back and enjoy things for what they are. That’s why I never go on vacation. The time spent doesn’t add up to anything quantifiable. No need to offer up platitudes on that front (not that you would). Another of my quirks is that I find “sometimes you have to stop and smell the flowers” advice maudlin and condescending, as if I lack the intellectual wherewithal to understand that there are other ways to live life. I sort of get what your saying, though: we all know that the best way to improve at a task is through regular (if not constant) effort, thought, and analysis (which does take a lot of the fun out of things, but such is an artist’s lot). And I, at least, do find that the writing time I lose when I go on vacation is compounded by my temporarily forgetting to write for a while when I return. But I still love going on vacation for reasons that will actually be the topic of next week’s post. I’ll be in Oz for a whole month in November – not writing, forgetting how to write, and (hopefully!) reading reference books on Ancient Greece for my next novel on the beach! Ancient Greece is a worthy diversion. When I’m at the Met in New York, I could wander among the Greek pottery for hours. Greek Pottery inspired the theme of my first novel manuscript, in fact. I’m sure the anguish of vacationing (!) would be lessened considerably if I didn’t have to break the bank to go anywhere. And if I had a book or two in the bookstore. I feel like I can’t let my foot off the pedal until that happens, which probably means I’ll never go anywhere again! In advance: I hope you have an amazing time on your trip and will miss your weekly posts during that time. I’ll also envy for not having to see 8 million posts about [the annual novel-writing event that takes over WordPress every November, which I have vowed never to say again]. Travelling is expensive; I’ve put this trip off for 3 years in order to save some more. If I wait any longer, though, I fear I’m risking a de-friending (that, and I was bitter no one would play with me on my 35th birthday last year, so I decided this year to take the party on the road). But I totally feel you with the idea of keeping the pedal to the metal. I’ve been writing for a long time now (save the 6 years I wasn’t) and have rearranged much of my day-to-day life to accommodate. TV is a simple example: I won’t say I gave up TV to make more time for writing – it was actually for a guy who disliked TV – but after he and I went splitsville, writing prevented me from getting my TV back. I now allow myself to watch a couple hours of Netflix only on weekends. I think if I ever do succeed in being published, no one will feel more relieved than my mother. I think she thinks my “writing career” is the reason I’m not yet married. Maybe she’s partly right. Eh, who needs a piece of paper from the state. I’m sure there’s a cool, open-minded dude out there who could be your romantic partner while also giving you the time and space to write (not that you need a man to complete you, and all that other stuff you know I already think). But probably not the second paragraph. It comes and goes for me. I’ve dribbled to a halt recently though that doesn’t worry me overmuch. When on a roll I’ll grab any time going, though like you I work full-time and I’m not so inclined to carry on into the evening. Maybe once ‘A West Cork Mystery’ is launched on the high seas – December? – then I’ll get back into writing in the gloomy months. A vacation from writing is useful from time to time. One’s never really on vacation from it anyway, for most writers seem to find it impossible to turn off the writer’s brain 100%. Becoming a writer forever changes a person and the way you interact with the world. Hi Victoria, thanks for the comment! I sometimes wonder how my perspective on writing would change were it to become my bread and butter. One of the things I actually kind of love about it is how I have to make a conscious effort to prioritize it and fit it into those furtive moments in between real life responsibilities, like I’m having a secret affair with my own imagination. I feel like a lot of that specialness would be lost if it became a true job – an actual obligation rather than a personal one (not that I wouldn’t do it if presented with the opportunity, of course).